ملائيشيا: ايشيا جو ھڪ اسلامي ملڪ جنھن جي گاديءَ جو هنڌ ڪولالمپور آھي ۽ جتي وفاقي نظام آئيني بادشاهت سان لاڳو آهي. ↑ "Malaysian Flag and Coat of Arms". Malaysian Government. وقت 22 October 2013 تي اصل کان آرڪائيو ٿيل. حاصل ڪيل 9 September 2013. ↑ "Federal Constitution [As of 1 November 2010]" (PDF). Attorney General's Chamber of Malaysia. حاصل ڪيل 10 November 2017. 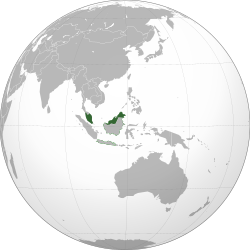 ↑ "Malaysia Population Clock". Department of Statistics, Malaysia. وقت 5 December 2013 تي اصل کان آرڪائيو ٿيل. حاصل ڪيل 16 March 2014. ↑ "Gini Index". World Bank. حاصل ڪيل 11 January 2018. ↑ "2015 Human Development Report" (PDF). United Nations Development Programme. حاصل ڪيل 15 December 2015. هيءُ صفحو آخري ڀيرو 20:32، 6 اپريل 2018ع تي ترميميو ويو هو.